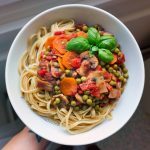 Continuing on with the theme from yesterday’s post, I wanted to offer some general tips for saving money on vegan food. These tips are from my e-book, Eat Like Me: High Carb Low Fat for Beginners. Tomorrow I’ll offer tips on how to save money when shopping for fruits and veggies. Focus on whole foods instead. I love that we can find a vegan version of almost anything: “chicken” nuggets, burger patties, ice cream sandwiches, mac & cheese…While delicious, these foods are much more expensive than whole vegan foods like produce and rice. They are also higher in fat and salt, and not as nutritionally dense. So for your wallet and health, I recommend only indulging in vegan convenience foods as a treat. The cheapest meals at home are those that consist of whole fruit, veggies, and staples like oatmeal and rice. Buy staple foods in bulk. If you eat a lot of rice, buy the biggest bag of rice you can find. Larger sizes are usually cheaper (per ounce, kilogram, or unit) than smaller sizes. Do the math and figure out the price per unit if you aren’t sure. Some grocery stores even have this information printed on the price label on the shelf. Don’t eat out as often or avoid it completely. Eating out is very expensive! Track your spending—every penny—for a week or even a month and see how much you spend eating out. Your money will go further at the grocery store. Eating at home is also healthier because you control exactly what goes into your food. Try to use up all the food you have at home before going to the store. When you do go to the store, only buy what you need. When I live alone my fridge is almost empty because I only buy a few items and use them that day or the next. Unless you are feeding a large family, your fridge doesn’t need to be completely full of fresh produce. If you have a little bit of shredded carrot left and you have no idea how to use it, throw it into your pasta sauce or add it on top of your hummus toast. Add extra roasted veggies to your wraps. Really make an effort to use up everything! Any food you throw away is your money out the window. Keep foods you need to use soon near the front where you can see them. Move sauces and jams to the back. Keep a mental inventory of the food you have at home and plan meals around those foods first. Keeping a mental inventory is easiest when you only purchase what you need. I hope you find these tips useful! How do you save money on food? « How much do I spend on food?